Solid information indicates that Google Nexus 8, Google's next new Android tablet, is coming out this fall, be it July or August. According to the same source which revealed the release date, Google Nexus 8 is coming in a near-9-inch slate. It is reported that Nexus 8 will feature a 64-bit processor and an 8-inch 1920 x 1080 full HD display. Obviously, this Google Nexus 8 is definitely bigger, better with more functions, bringing the ideal video playback experience. However, not too many videos can be played on Google Nexus 8 in which case you need to convert video to Google Nexus 8 first. Have you ever troubled by the same issue? Do you wonder why this problem exists? Is it possible to play video on Google Nexus 8 without any limit? This article will give you what you want. Well, suggested by its predecessor, namely Google Nexus 7, Nexus 10, the Google Nexus 8 supported video formats are limited to H.264/MPEG-4 (.mp4), 3GPP (.3gp), MPEG-TS (.ts), WebM (.webm) and Matroska (.mkv, Android 4.0+). That means many videos, such as AVI, MOV, WMV, FLV, M4V, MTS and etc can not be played on Google Nexus 8. To solve this problem and play video on Google Nexus 8 without any limit, using a Google Nexus 8 video converter is a good way that you can try. 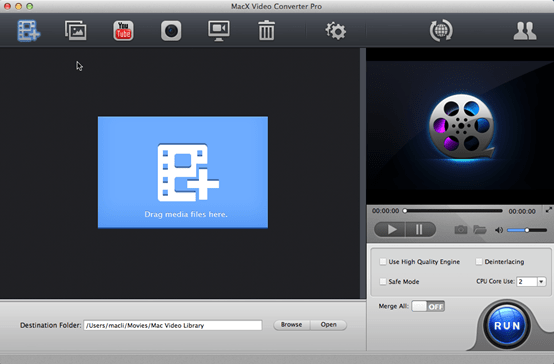 Here MacX Video Converter Pro is highly recommended. With this program, you can convert any video format such as AVI, MOV, WMV, FLV, M4V, MTS to Google devices, including Google Nexus 8, Google Nexus 7, Nexus 10, and Google mobile phones Nexus One, Nexus S, Galaxy Nexus, etc at 5X faster speed and no quality loss. The strong point of this app is the built-in profiles made for each type of the above Google devices, making it stand out among other similar software at present. Note: For those who want to freely watch videos on other mobile devices, namely to transcode video to Samsung Galaxy Note 3, iPad, iPhone, Google Nexus 7, Samsung Galaxy Note, HTC 10, Surface, WP8 and etc, this video converter is also a solid choice. After downloading this video processing program on Mac and run it, click "Add File" to load the the video file you want to play on your Google Nexus 8. 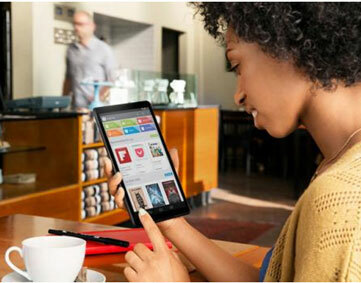 Select a Google Nexus 8 compatible format from the format category. Besides, you can adjust the output video parameters with the advanced settings to better fit your Google Nexus 8. Click the "RUN" button to start transcoding video to Google Nexus 8 on your Mac. This software will automatically helps you finish conversion, and you could view the conversion progress and are able to cancel the process at anytime. The whole conversion is 5X faster while reserving the original quality. 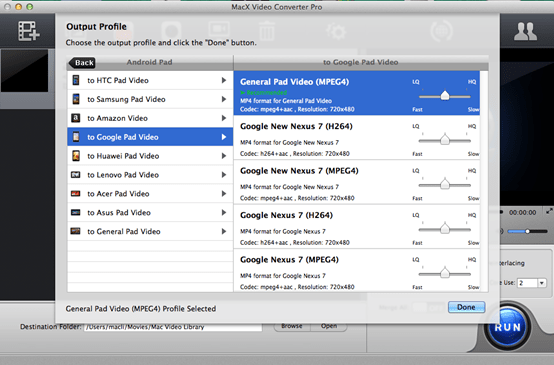 Note: MacX Video Converter Pro is well deserved to be the best video converter for Google Nexus 8. Among the many highlights, one of its distinct features you should pay attention to is the ability to download YouTube videos. You can not only download YouTube videos to Google Nexus 8, but also download YouTube videos and convert YouTube to Google Nexus 7, Nexus 10, other Google devices and mobile devices.